The False Killer Whale displays a very unique behavior. It will approach divers in the water and offer them its prey. The False Killer Whale is the fourth-largest dolphin on Earth (Orcas are the largest) and it’s a member of the Delphinidae: the oceanic dolphin family. In case you’re wondering why they have “false” attached to their common name, it’s because though the false killer whale shares some similarities with the more popular killer whale (Orca), both species are in different genera. Nevertheless, they still share many similarities like hunting and killing other large marine mammals. Also, just like Orcas, False killer whales are prone to stealing fish from longlines and this trait exposes them to slaughter by angry fishermen. These fishermen often hunt and shoot the false killer whale wherever they find it to save their catch. They are also a direct target of the annual Japanese drive-hunt fisheries. 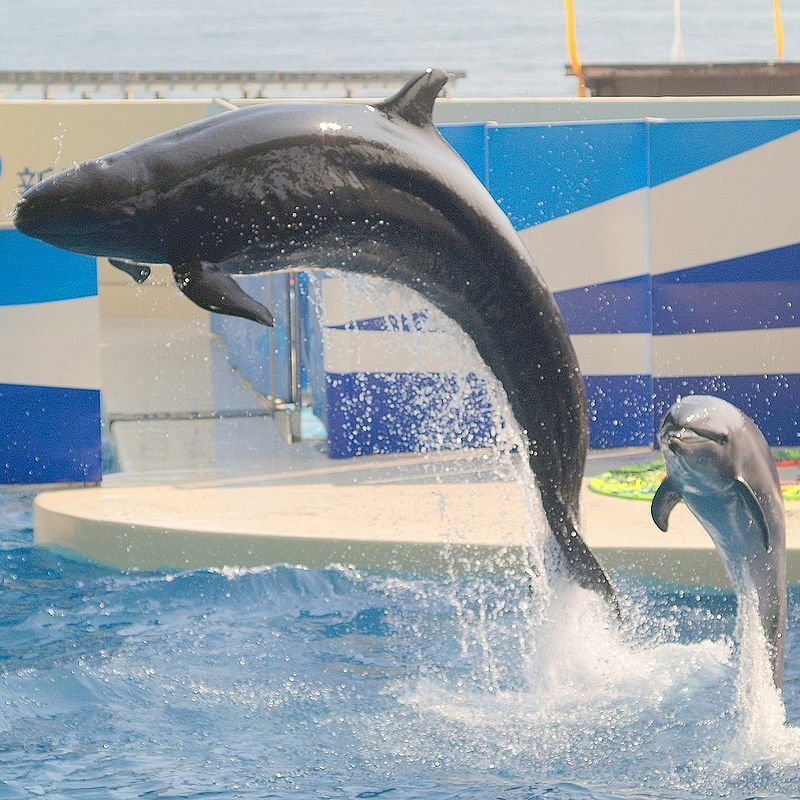 This dolphin has a long, slender body colored uniformly black or dark gray allover. Although a few individuals have a lighter colored head and sides. Some also have a pale ‘W’ shape on their chest. The head is narrow and pointed with a prominent, bulbous melon, no beak, and distinct S-shaped flippers. The false killer whale is a fast moving and energetic animal, it is not shy of boats or humans. They are also very social creatures often seen in pods of up to 60 individuals. In addition, false killer whales interact with other dolphin species especially the common bottlenose dolphin. Because there is still not much information about this dolphin, the IUCN lists it as Data Deficient. The false killer whale has an average lifespan of 55 to 65 years. They can grow up to an average length of 5.18 meters (17 feet) at full maturity. Females may grow a little less: about 0.30 to 0.91 meters (1 to 3 feet) shorter than males. The largest recorded male was 6.1 meters (20 feet). Adults typically range from 1100 kg (2400 lbs.) to 1200 kg (2600 lbs.) Maximum weight so far for a male is 2,200 kg and for females 1,200 kg. The false killer whale can attain up to 28 mph (45 k/h) when fleeing from a perceived threat. Very little is known about these dolphins for now and scientists are still studying them. These are very social animals that live in large groups. They communicate through high pitched whistles. False killer whales are not shy of humans or boats and they will approach people to offer them the prey caught in their mouths. They are very active and playful usually surfacing with their mouths open and showing their teeth to passing boats. Unfortunately, like Orcas, false killer whales steal fish from fishermen and the fishermen hunt, shoot, and kill them in retaliation. False killer whales are not shy of humans and will approach divers in the water offering them the fish they have caught. The average gestation period of false killer whale is about 15 to 16 months. Thereafter, for two years the mother will nurse her calve on milk. Calves average 2 meters in length. The diet of a false killer whale includes fish, squid, and cephalopods. However, they often attack marine mammals as well. They are better known for their sharing nature when they catch prey. Individuals share their prey with others in the group. Usually this happens when they catch very large-sized prey. The exact population of this dolphin is not known though estimates are in the range of 60,000 in the wild. Bycatch: As they are not afraid of boats, they easily get caught in fishnets. This is common during the operations of the Hawaii Longline fishery and the bottomfish fisheries off the Northwestern Hawaiian Islands. Marine Pollution: The sea and oceans where these creatures live keep getting polluted through several human activities like oil spill, trash dumping, etc. Tourist Activities: Continuous influx of tourists who want to catch a glimpse of the animal out in the sea. Hunting: Especially in the waters around countries like Indonesia, Japan, and others in the West Indies. Mass Stranding: In addition to the above problems, these are one of the most common species encountered in mass strandings. Sometimes, more than 800 of these dolphins will strand at a time. Though this animal is listed as Data Deficient by the IUCN, by November 2012, the NOAA listed the Hawaiian population as Endangered. Most threats the False Killer Whale faces are directly related to human activities. Scientists have not been lucky to study the false killer whale extensively in the wild. Therefore, most of the information about them is from examining stranded individuals. British paleontologist and biologist Richard Owen was the first person to describe this creature in detail in 1846. His work was based on a fossil discovered in 1843. He named it after comparing it to the Orca and the long-finned pilot whale. At the time, the assumption was that the animal was already extinct. Though some years later by 1861, Johannes Reinhardt confirmed seeing a pod of them at the Kiel Bay. Contrary to their name, they are not direct relatives of the killer whale (orca). They prefer tropical to warm temperate waters and they are widely distributed worldwide at depths deeper than 3,300 feet (1,000 meters). Fishermen often see them off Hawaii, the entire West Coast of the USA and other Mid-Atlantic coastal states. Other sightings are the shallower waters of the Mediterranean and Red Sea, then from Scotland to Argentina in the Atlantic Ocean. Also, in parts of the Pacific Ocean, the Indian Ocean, and even as far as Australia. This entry was posted in Species Profile and tagged blackfish, common bottlenose dolphin, false killer whale, orca, orca killer whale on September 6, 2017 by Roselyn Onuche.